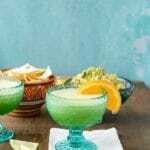 These fresh, light, refreshing Honeydew Melon Margaritas are a unique take on a traditional margarita. Using frozen honeydew melon cubes instead of ice makes them creamy and smooth. Purchsed or homemade (instructions in recipe) melon cubes may be used. If making homemade melon cubes the freezing time will need to be added to the total recipe time. Line a rimmed baking sheet with wax or parchment paper. Cut melon from the rind, removing any seeds; cut cubes approximately 3/4 inches in size. Place melon cubes in a single layer on the prepared baking sheet. Place in the freezer until frozen. After they are frozen, the melon cubes may be stored together in a plastic bag or freezer-safe container. Note: if melon cubes are frozen together instead of individually first, they will form a large block due to the high water content in the melon. Place all ingredients into a blender and blend starting at low speed, increasing to higher speed, until the melon cubes are pulverized. Recipe may be doubled in one blending.